Joseph Gordon-Levitt stars as Edward Snowden. The debate regarding whether Edward Snowden is a traitor or patriot after he gave The Guardian the scoop of the decade rages to this day. There is little debate, however, with respect to SNOWDEN the film. Although not perfect, it represents some of the best work director Oliver Stone has done in eons. And the subject matter, which falls in his realm of interest given his personal opinions of the government, makes for low-hanging fruit for the Oscar-winner, right? After all, he’s known for being a provocateur with past efforts such as JFK and NATURAL BORN KILLERS. And while Stone instills the film with his DNA, it’s so likeable for one simple reason – he’s nothing more or less than a storyteller as he directs from a script he wrote with Kieran Fitzgerald based upon the book from Luke Harding and Anatoly Kucherena. In SNOWDEN, he shows no proclivity to grind an axe against the U.S. government. Perhaps that’s because Snowden’s story, as told to journalists Glenn Greenwald (Zachary Quinto), Ewan MacAskill (Tom Wilkinson) and documentary filmmaker Laura Poitras (Melissa Leo) is so damned compelling on its own. After all, what story of a guy blowing the whistle on his government’s illegal intelligence gathering operations against its own citizen wouldn’t be? 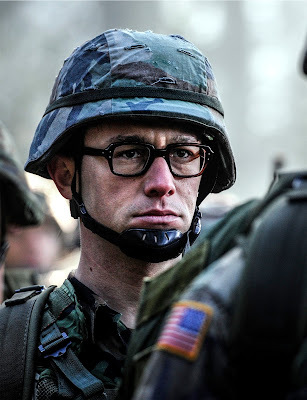 Told through flashbacks, Stone takes us through the story of Snowden (portrayed by Joseph Gordon-Levitt) in great detail, focusing on how he went from beginning his service to the country as a candidate for special forces, to that of National Security Agency private contractor. That in itself is fascinating, but Stone and his cast delve deeper. He gouges beneath the surface in attempt to paint a complete picture of Snowden, and with the help of Gordon-Levitt succeeds. It’s not only a film about his service, but Snowden shows his evolution as a person. At one point in the film he jokes that people often referred to him as a “robot.” With respect to his blind loyalty to country that couldn’t be truer. Snowden’s journey is also a personal one as he comes to realize that the U.S. government and the country he loves so much isn’t above using questionable methods to advance its goals. Stone wisely shows this as a gradual and mostly intellectual process. Some will recognize that Edward possesses great intelligence, but some early in the film would have viewed it as a waste of intellect given his political leanings. In some respects, Stone is remarkably restrained in dealing with the issues. However, he deserves praise for two other reasons. He directs his cast with skill, coaxing subtle, emotional turns out of them without having them resort to artificial drama. That leads the second factor: while you know dramatic license is taken, SNOWDEN doesn’t feel padded, nor does any of the drama show any symptom of being artificial. The lone quibble that can be taken with Snowden: he could have lopped 10 minutes off the end and they would not have been missed. It’s something that’s easily forgiven. Stone combines the personal with thrills to create a satisfying experience with SNOWDEN.